What am I doing with them? I'm really pleased with how things panned out this year. I think I've been very blessed. Truly, I can't complain. This year, I learnt that I can be contented with very little things - when a friend actually misses you, or just saying hi online, or a friend who would take the time to go exploratory walks with you...these are little things that don't really cost a thing but means so much. I am extremely grateful and thankful for all the friendships, support and love that I've gotten. I've never been excited over the new year, but I'm quite hopeful and optimistic about the next year. I don't really have new year resolutions, because I don't think I am one who will stick to them. I am actually hoping time can fast forward to March, even though I only know how true it is that the only thing that is constant is change. Before I know it, spring time will be here, so I will start living at this moment right now. I want to continue to make people smile, to me it's the greatest gift that I can give. To make someone smile through my creations, photos or writing is a pure gift...so I am mindful and will continue to work hard at that. Thank YOU for accompanying me through this journey. I am happy that you are here. Earlier this month, I participated in my very first dollhouse miniatures Christmas swap organized by Caterina. I was picked to make items for Caterina and in return I would be receiving items from Ana. I received Ana's package and am so happy...she makes such romantic sweet items and here are what I received. Ana made me this basket of lovely pastel sweets :) I love the white christmas candle stick! I’m always discovering something new about air dry clay, in this case, Grace Clay. I bought some grace clay recently, and when it arrived, I pressed on the package to get a sense of whether it’s a fresh pack of clay or not. When it didn’t feel as soft as another batch of clay that I’ve got, I started investigating. I studied the packaging and pressed on both packets of Grace Clay again (bought at different times). I suddenly thought of how my mom taught me how to tell if a fish is fresh when buying one in the market. One of the ways to tell was by pressing the meat with your finger. It should be resilient enough so your indentation disappears. If your fingerprint remains, move on. Now, simply reverse this theory for testing Grace Clay. If the indentation remains, or it takes a longer time for the clay to revert back to its original shape, then it is a fresh packet. If it feels hard, move on. I flipped to the back of the packaging and started to look for signs. Noticing a difference, I seriously wonder if this was the cause of it. I also did a search on the internet to find images of Grace Clay. I specifically wanted to see the back packaging (Not the front). But all I found are images of the front packaging which wasn’t helpful in my research. Are there even “grades” for Grace Clay? But the packaging seems to indicate so. Even a non-clay user whom I asked thinks that it refers to Grade A and Grade B from the print. What do you think? I did the finger indentation test just to show you what I meant. Below are the results. This means details being sculpted on the Grade B clay would show up less obvious than on Grade A clay since it would spring back slightly, compared to Grade A which is softer and likely to hold details better. I then tested the Grade B Grace Clay texture. I was thinking that maybe the finger indentation test was just psychological on my part. Maybe there would be no difference. I can recall very clearly how Grade A Grace Clay felt like on my fingers. It was very moist and soft. I can definitely say there is some difference. It’s not as soft as Grade A. Grade A also tend to retain its softness very well even after you’ve opened the packaging and keep it in good condition as what I’ve described in my tips here. Does it mean it’s Doom’s Day? This might be what you’re most concerned about. What does it mean to you as a user? Unfortunately, there really isn’t a good or bad because everyone sculpts different things in different sizes. How fast they consume the clay, and how well they keep their clay are other factors to consider. Sure, of course everyone wants the best Grade, considering if my suspicion is true that there really is a Grade differentiation for Grace Clay. Based on my personal experience, the Grade A Clay keeps really well even for over a year. It remains soft. But what if you didn’t know beforehand, and you already have a Grade B clay sitting in your cupboard? I always think that there are ways to work around it. Although you can’t change the texture of the clay, but you can think of what are the things that you can use it for and how you can use that to your advantage. What about making bigger items, or items that does not need that many fine details but still in good, long lasting durable quality? This might also be a good experimental opportunity to mix it with other clays to see what results you can achieve. You should always also consider these questions when buying your clay. Would you be able to store it well until the next time you are using it? How did everyone spend their Christmas day? 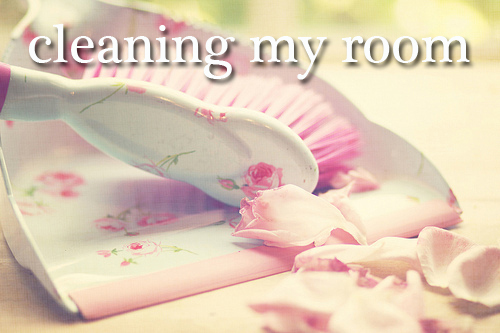 I hope you did. I had a raisin danish croissant for breakfast and it was yummy! This pretty much sums up my Christmas Day. How did you spend yours? 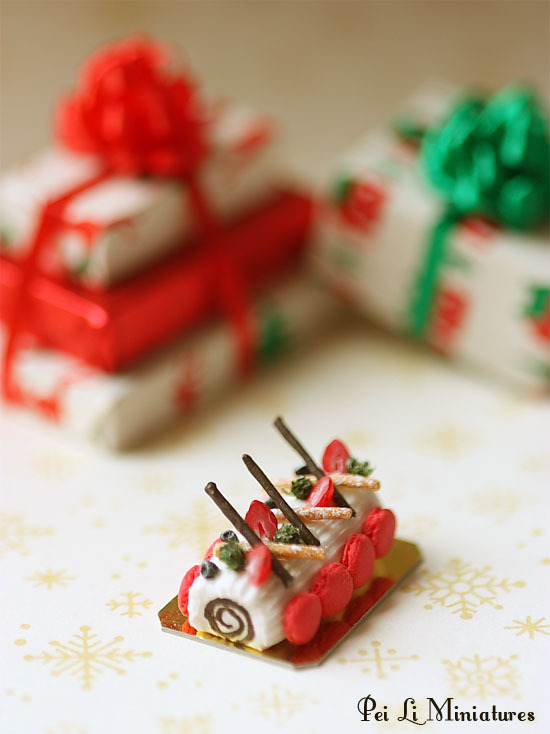 I visited Antoinette Patisserie Singapore for the first time to visit my Christmas gift box. It was actually called Saint Honore Gift Box. 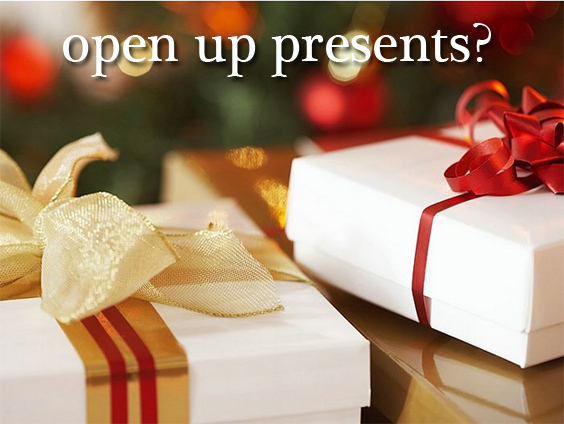 I was very excited when I collected it as it was packaged beautifully with gift ribbons and christmas decorations. If you asked me how the cookies taste, I'm afraid I don't have a full answer, as I gave most of them away to my aunt. But I've tried the galette bretonne chocolat - which was really delicious as it was NOT sweet and tasted of dark chocolate. Heavenly. :) My favourite one, I would say. The one that I had the strongest impression was defnitely the galette bretonne chocolat. I would definitely get it again if they ever sell them as loose pieces. 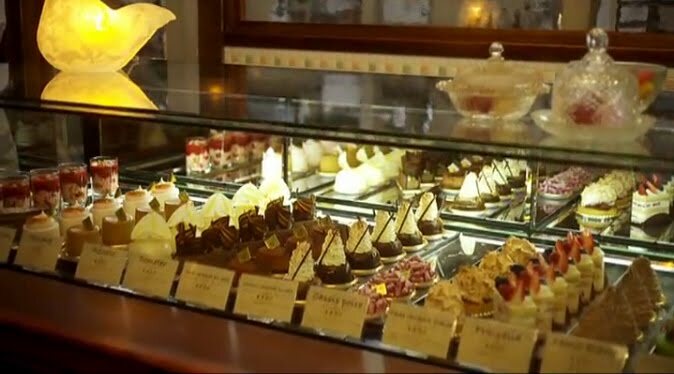 After my visit to Antoinette patisserie shop, I have been inspired to make the 1/12 dollhouse miniature scale St. Honoré pastry. It must be the pink colour. Their version was a lovely lovely sweetest shade of pink, almost like a lip gloss pink, which just made me smile. I slowly started off making the bases, and then the tiny profiteroles. I decided to go with a delicate shade of pink for the whip cream too. This can be purchased in my dollhouse miniature food section of my shop! If you require this in other quantities, please let me know. Before you wonder, no I'm not talking about the movie. 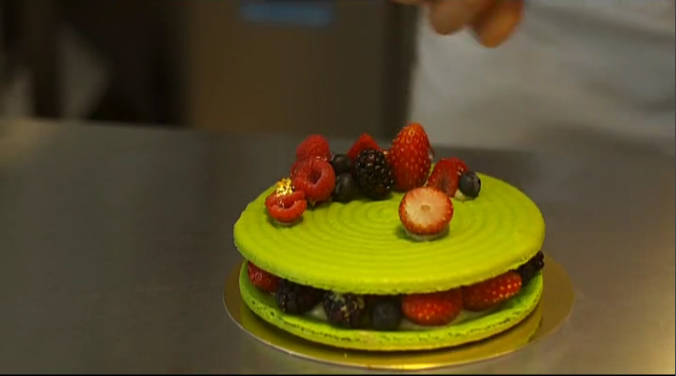 ;) Antoinette Singapore is a new patisserie and dining place offering a variety of sweet and savoury French specialties. 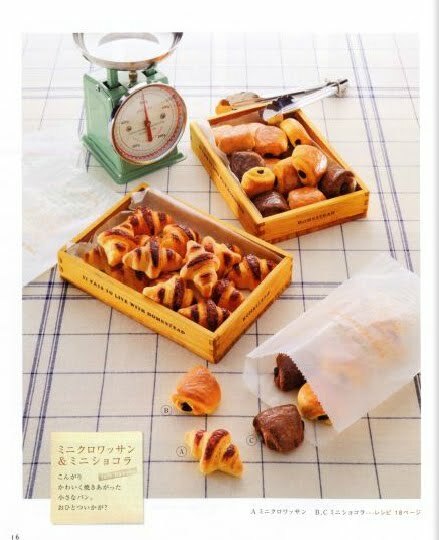 In their Christmas catalogue, it was mentioned that their shop was named after the last queen of France whose love for meticulously-crafted pastries was well known. And having seen their pastries, I must say they look exquisite! There are actually 4 branches already in Singapore, but fate brought me to visit the one at Penhas Road, where I was there to collect my long awaited Christmas Gift Box! This branch was tucked in a quiet corner of the street. There aren’t any shops or obvious landmarks beside it, so you have to look out for this. But once you step inside, you will be greeted by a long wide table filled with scrumptious looking goodies! I went to ask about my gift collection, and while the staff went back to check, I looked around the shop/cafe a bit. It was quite roomy and I can't help but be drawn to the table of goodies. Not knowing if photography would be allowed, (as there are some shops that doesn't allow photography of their interior), I have since then been very mindful and would always ask first before I snap away. When the staff said yes, I almost felt like I struck lottery! On the table were all sorts of treats, from christmas specials to butter croissants to meringues! This is the first time I hear about Chocolate Brioche, but they just look wonderful! I regretted not getting one of this Pain Au Chocolate home, because they looked so delish! Though I’ve never ate Christmas stollens before, these are so beautiful! I love how colourful and cheerful looking these Traditional Christmas fruit cakes look! They have a few macaron towers which are prominently displayed at their side product shelves. These dollhouse miniature accessories wall decor frame art came out looking very "wintry looking", which made me smile alot. Initially as I worked on them, I didn't really quite imagined how they would look like. I played around with a few colour options and decided to give it a rustic aged frame. I love those pictures a lot and as I saw them come to life, I can't help but look at them again and again. Definitely a favourite photo of mine at the moment! I decided to give this dessert another try. In one of my earlier posts, I mentioned that the macaron I tasted was too sweet for my liking so naturally though I love the colours of it, I wasn't inclined to try it. This is my second time trying macarons. I didn't like the range of flavours that were offered in the first shop I happened to pass by. I am not really experimentative with food and wanted something more mainstream...but this shop (maybe this was their seasonal offerings), had too many sophisticated flavours that I can't really visualize how the flavours would taste like :P The whole range was focused on tea-infused flavoured macarons. So I decided to give that a miss. In the 2nd shop that I went to, I was happy to see that they had some mainstream flavours and I picked the strawberry macaron with vanilla cream to try. The shell could be 30-40% less sweet still. But I did like the strawberry taste. It was flavourful and the vanilla cream complimented it so well. LOVE the vanilla cream. I thought it would be the same like the previous macarons I tasted, until I bit into the middle of the macaron. OOOhhh....I tasted the slightly tart strawberry jam/puree, whatever you call it. I love how it brings down the sweetness a bit. Heavenly. I still have a few other flavours to try out, but I am liking this one so far.. It has been on my mind for a while to try to attempt making some food jewelry items - especially cupcake ring. I finally had some time to attempt this. For my first ring, I can't help it but make it a pink colour, which is my favourite colour. As I was thinking what kind of decorations I wanted to include on the top, I considered sweets which I would like to attempt later, but first I really wanted something very feminine and elegant, so for this one, I included the pink rose too. My source of inspiration came from looking at the real cupcakes which has flowers on them. How can I not watch any movie which has the word Patisserie in it? I even thought it was a French Film, but it wasn't. In fact it was a Japanese Film. What I liked about this film was, of course the cakes, pastries and desserts. 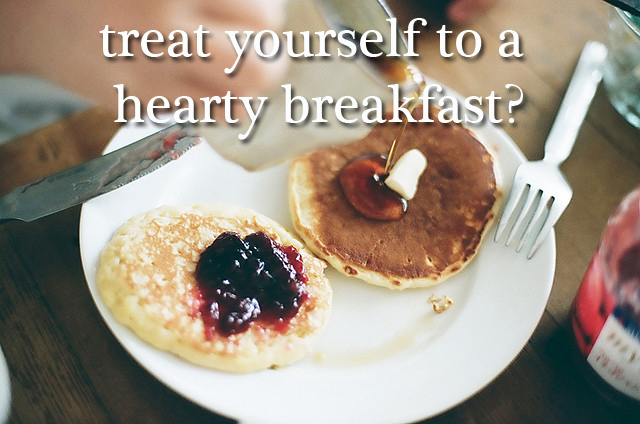 Everything looks yummy. I also love their quaint antique cake shop, a place whereby you can sit a little while longer, rest your feet and treat yourself to a splendid afternoon with tea and cakes. And the shop is not on the main road, so it's really quiet and has nice surroundings. How lovely! But what I felt wasn't realistic probably was they would start making the "special order" cake at the point only when it was ordered. It felt like they were making it from scratch, which I think was a little unrealistic perhaps. Or maybe I'm a little dated, I don't know if real patisserie shops do that now? This cake display makes me drool....OOOhhh. 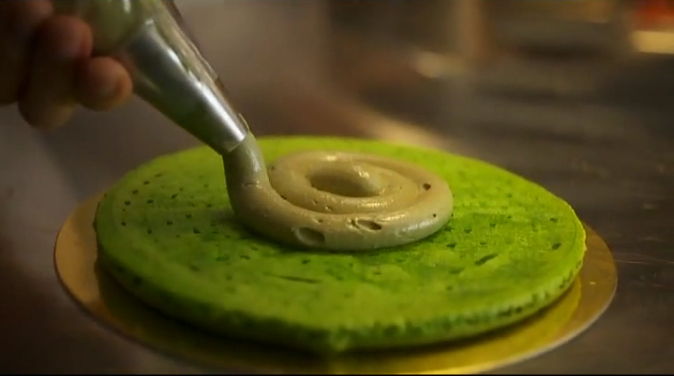 I love the green cake base. 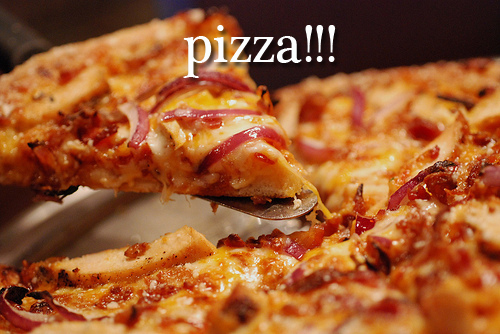 It looks yummy, or maybe I'm really hungry. Ahhhhh ....Would so love to try this! I think these pictures are incredibly beautiful...they were actually a calendar of some sort, but when I saw them, I thought of making them into dollhouse miniatures to capture their beauty. I didn't want to put the calendar up on my wall...well I don't have much of a wall space and besides, I do prefer a desk calendar. So I had fun during the weekend making these lovelies into wall frame paintings, of course in 1:12 dollhouse miniature scale. I will be offering them on my shop pretty soon, and so do look out for it. Since they were made to be a calendar, the print and quality is incredibly lovely. Don't miss out on them as once they're sold, they will be gone forever. It’s been a while since I did any craft books review. I got this book a while ago and am going to review it! Though this book is targeted towards felt crafters, I decided to review this book because I strongly feel that there are really good techniques here that are extremely adaptable and useable for clay crafters. I am actually quite excited about it after looking at the book. Very interestingly, many years ago, I was into felt craft as well. I made felt swiss rolls, cakes and all the sweet desserts. 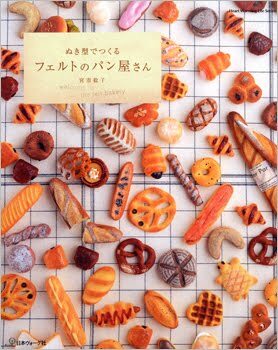 After looking at this book, I think that felt craft has actually evolved a lot these years, so much so that felt desserts and pastries have reached a new level of sophistication and realism. This book introduces felt crafters to clay work as well. The main idea is that before they can actually make the felt items, one has to sculpt the "master" item from clay, and then use it to make molds which will later be used for felt work. 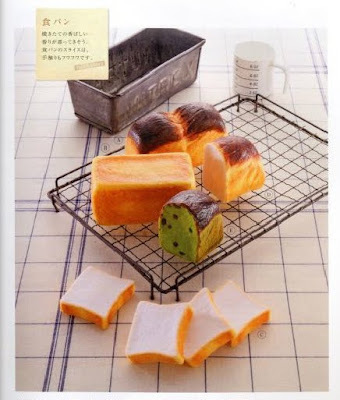 Because of that, there are some very interesting sculpting skills (from basic to intermediate) one can learn from, especially if they are interested in making dollhouse miniatures - bread from scratch! 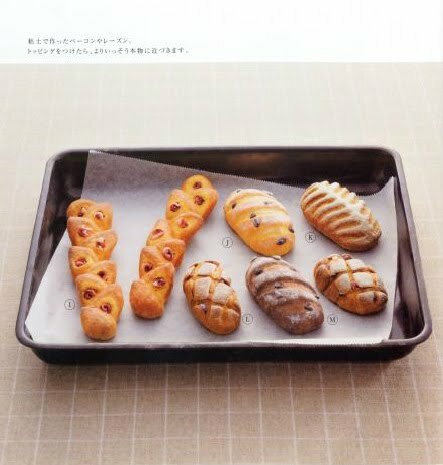 There are tons of different breads to learn, and I think this should keep a lot of bread enthusiasts engrossed and occupied for a long time. Although the items made are larger and not in dollhouse miniature scale, I do think that this can be easily adopted appropriately in the scale that you work. This book has 54 coloured pages and even step by step diagrams are coloured. Even though the instructions are in Japanese, with the clear diagrams it would be easy to understand. I've not come across such an interesting craft book in a while and this is definitely a keeper! You can now purchase this book directly here for US$38.90 - shipping included and I ship worldwide! Just click on the Buy Now button below and it will take you to Paypal. Even if you don't have a paypal account, you can still purchase this with your credit card. You don't need to have an account to purchase it. Joanna swung by Singapore for a business trip this week and we managed to meet up for dinner and catch up! I was hoping that she could stay on for another day or 2 so that I can bring her to some quaint and cool places, but she had to go back to work....so we shall do that the next time she swings by here! We ate, walked around and found some cooool neat stuff. We are thrilled to bits actually. I rarely shop here and the fact that I can actually be excited about it is really something. Hehe. Another day, I can show you what I find. 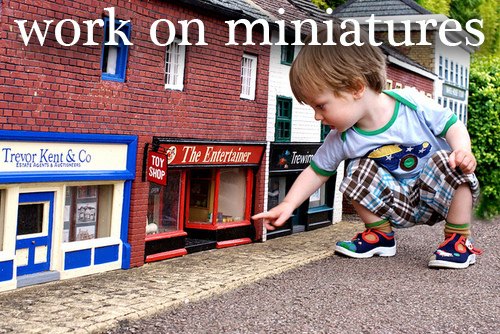 Not related to miniatures though! Here are just a few photos that I took. While waiting for our food to arrive, we both sat, relaxed and enjoyed ice lemon teas. Joanna had beef. I don't remember the full name of this dish though...sorry! 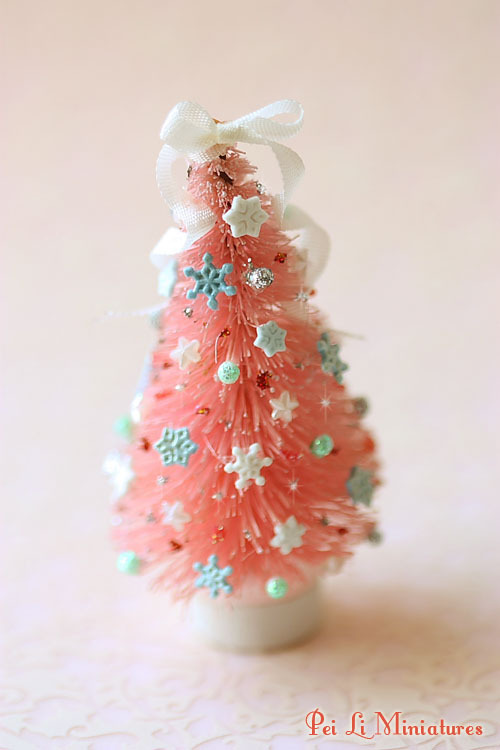 I have never imagined a pink christmas tree until a few years ago, when I really like the colour pink and I wanted everything (almost) pink. When I was a kid, christmas trees were always green, and they had colourful lights, so you can imagine that was what my idea of what a christmas tree would be like. This year, I had new ideas for a new dollhouse miniature christmas tree. Not only will it be pink, but there will be some blue, and more importantly, it will be all glittery and shimmery! I find that cosmetic colours can be a powerful source of inspiration for me too, as their ranges of new colours are often so pretty and it gives me so much room for imagination! From what I've noticed, Christmas colours for cosmetic makeup are often always so glittery and shimmering! I hope you like my version of pink christmas tree! Available at my dollhouse miniatures store! Thank you to all of you who had participated in my Blog Giveaway posted on 3 Nov. 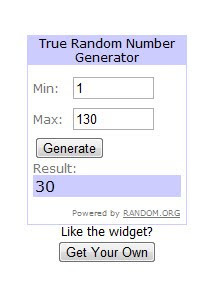 There was a total of 130 comments, and with the random number generator, number 30 was picked! And now, I am sure everyone is excited to know who is the winner. Sweet Fabiola I will be contacting you soon to get your mailing details! As for the rest, (without sounding like a tape recorder), this wouldn't be my last giveaway, so please look out for the next. It pretty much summarizes exactly how I felt. You know how sometimes, there is just an missing element that makes it "ahhh", but at that moment, you don't know what that is. I remembered taking some photos of this dollhouse miniature christmas log cake a while ago, but something just wasn't quite right. I felt that I did not manage to capture its beauty back then. But today I knew why. The answer was lighting. We had beautiful weather in the morning today. The sun wasn't exactly scorching but I felt it was just nice. I swear it really was the sun that gives a soft glow to it. So here I am again, presenting this special christmas log cake. I took reference from a real christmas log cake, and love this modern contemporary feel. I am a bit late in wishing all of you guys who are celebrating Thanksgiving a Happy Thanksgiving! Happy Black Friday! For those of you who enjoy shopping on a Friday, I hope you score some great deals! 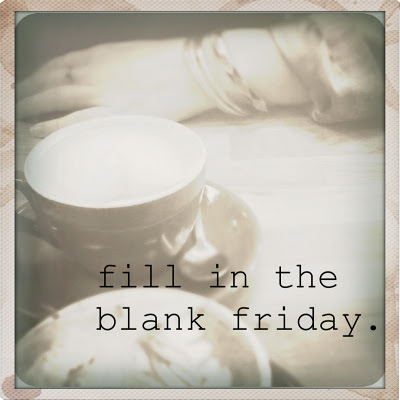 It's been a while since I did the Fill In The Blanks Friday, but today, I DID remember, so here I am! 1. Waking up at the break of dawn to go shopping is my idea of a US holiday tradition ;). I have never experienced waking up at the break of dawn to go shopping and even if there is a tradition here locally I doubt I would do that. BUT I would wake up at the break of dawn to catch a plane going for a holiday! 2. If I were to go shopping today I would be on the hunt for candles and especially candles with lemongrass scent. That was what I could think of all morning, and which I finally succumb to getting some online ;) It must be the cool weather here, that makes me want to enjoy a nice relaxing room scent . 3. The best thing I ate yesterday was egg mayonnaise and ham sandwiches served on a really soft white bread. It's been a while since I had sandwiches for lunch and they do taste so good . 4. Something I've been learning lately is to live in the present, to feel and enjoy the present moment. It is a waste of energy worrying about what's going to happen in the future because you just never know what's going to happen tomorrow . 5. I cannot start my day without my morning cup of hot strong tea . 6. My nighttime attire consists of a sleeveless top and shorts. I never wear long pants unless I'm travelling and sleeping in a hotel room . 7. I am looking forward to tomorrow. 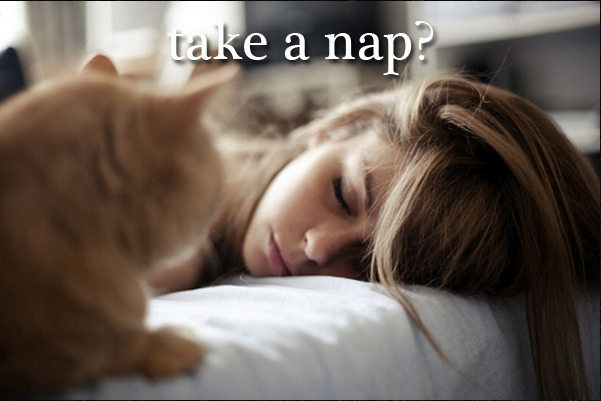 Weekend. Monday! . Please look out for the promotion code on my fan page tomorrow! Meanwhile here are some of my latest work!